Made in Adelaide, South Australia, Australia, 1956-1959. In 1946 Lance Hill wanted to save his wife from the daily battle with the old wire clothes line and heavy wooden clothes props. In his Adelaide backyard he made a rotary hoist. By simply turning a handle a full line of washing could be raised. A model of a galvanised-iron rotary clothes hoist comprising a wire clothes line strung on arms of metal tubing forming a rotatable square which could be raised or lowered. The rotary clothes line sits on a three-pronged flat pedestal base from which rises a central support column. This features an operating rotary handle and four metal tubes which form the top section. The tubes are strung with five rows of wire on which to hang the clothes. Stamped twice on the central rotary section "Hill's Hoists" and "oil". Stamped on the handle is a plate with the wording "Hill's Hoists". This small rotary clothes line is a toy version of the full-size Hills Hoist first made by Lance Hill (d.1986) and his brother-in-law, Harold Ling in 1946. Hill did not invent the rotary clothes line. Gilbert Toyne (1888-1983) patented ones in Australia between 1911 and 1946 which were sold in small numbers until the early 1960s by Toyne's Rotary Clothes Hoist Pty Ltd.
After Lancelot Leonard (Lance) Hill returned from the Second World War in 1945 to his home at 7 Bevington Road, Glenunga, an Adelaide suburb, his wife, Sherry, complained that washing on her traditional clothes line, strung between two posts and held up in the centre by a clothes prop, kept snagging on two orange trees. Hill's answer was a rotary line made out of old water pipes and wire. The problem of raising the line into the wind was solved with a modified car differential familiar to Hill as he had a been keen motorcycle speedway racer before the War. Once his wife's clothes line had been completed there were others requested from neighbours, family and friends and these were made in the Hill's backyard. Lance, and his brother-in-law, Harold, pooled their demobilisation money and with some money contributed by family members set up the firm in 1946, Hills Hoists Ltd, which went on to become a multi-national company. The post-War lack of resources, especially metal tubing, had to be overcome and old aircraft, which were full of wire and tubing, were purchased from Air Force disposals. Their supply difficulties decreased when the firm acquired a tube mill which manufactured water pipes. Manufacturing moved out of the Lance's backyard to 262a Glen Osmond Road, Fullarton, in 1948 and to the former Pengelley coach-making factory at South Road, Edwardstown, 6 km SW of Adelaide, in 1954. Lance Hill retired from the company in the mid-1950s. By 1956 the Adelaide firm had the head office and factory at Edwardstown and Australian branches in Melbourne, Sydney, Brisbane, Hobart and Perth. There was also a New Zealand office in Auckland. Clothes lines were fitted in capital city areas by Hills Hoist experts and instruction booklets issued for those purchased in country areas. To go with your clothes line the firm also made a number of other products focused on the backyard including the folding laundry pram, the "comfort" folding chair, this toy mini version of the clothes line called the "Mini-Hoist" as well as paddle pools, and outdoor swing and gym sets for children. "The Australian Women's Weekly" of 5 December 1956 advertised the "Mini-Hoist" saying it was "The practical gift for little girls. They will play for hours hanging out their "washing" just the same as Mother. Strongly constructed, it is an exact working miniature of the famous Hills Hoist and even includes the winding gear." A full size Hills Hoist was also advertised in 1956 as the ideal Christmas present for a mother. Few women today would think this. A canvas canopy could also be purchased to fit over the top of the clothes line providing "the perfect sunshade on summer days" for outside entertaining. In 1958 the firm formed a new holding company, Hills Industries Ltd. They expanded and diversified into ironing boards, television antennas, CCTV equipment and building and roofing materials. Manufacturing plants were established in the UK and New Zealand and their products were sold in Hong Kong, Singapore, Malaysia and other parts of SE Asia. 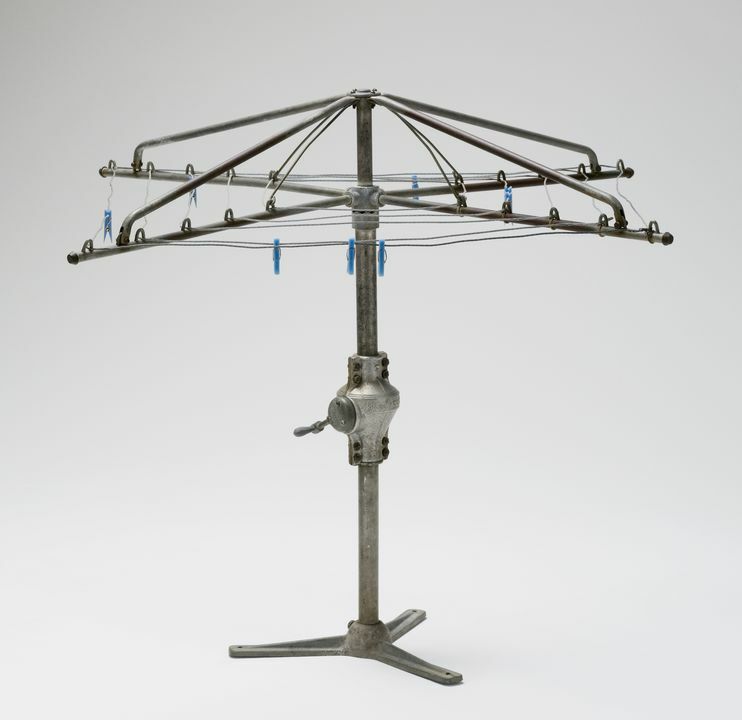 This toy version of a Hills Hoist rotary clothes line was purchased from an antique shop in Roseville, NSW, in 1987 for one of the exhibitions developed for the opening of the Powerhouse Museum entitled "A Material World". A very similar toy clothes dryer is featured in 'The Great American Antique Toy Bazaar 1874-1945' featuring a Butler Brothers 1925 catalogue. This object is currently on display in Store 2 at the Museums Discovery Centre.